Sharkwater VR is an experience designed by Occupied VR and Sharkwater, a shark conservation company created in honor of award-winning photographer and conservationist Rob Stewart. You can access the Occupied VR Portfolio for the project here. 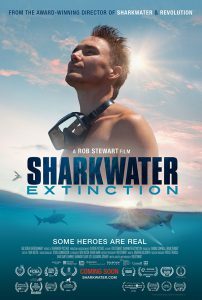 The experience – directed by Rob Stewart – accompanies a documentary created by Sharkwater, called Sharkwater Extinction, which dives in to the world of shark finning and the political corruption that has allowed the industry to live, and even thrive. The VR experience was one that I personally enjoyed. It gave such a great up-close view of not only sharks, but a variety of different creatures, including rays and an eel. When you begin the video, Rob tells about his first encounter with a shark, and why he is doing the work he is. His words were much needed, providing emotion on why his efforts were important and just an overall context to the video. Once he is finished, music plays throughout as you get the opportunity to explore the ocean as if you were a diver. 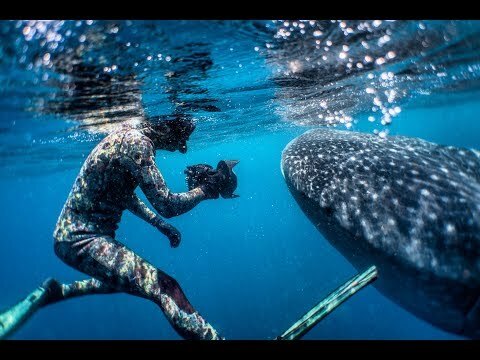 Person shoots video of whale shark. Image from http://www.youtube.com. The shots were of pretty good quality, especially for the lack of light in some areas because of the depth. Even in some moments where you could see the cameraman – more on that later – there was something to look at in each direction. A couple clips where you were right in or on the edge of a school of fish come to mind for this. The video was location driven in my eyes. There were no audio cues for when to turn your head to look a certain way, which enhanced the experience. If there was influence to look a certain way, they would use a swimming creature. You naturally follow it with your eyes leading into other animals being seen. While the video is one I enjoyed, there are some weaknesses that came along with it, starting with the cameraman being visible. Being in the middle of the ocean though, one can not just release the camera, let it sit there and hide behind a bunch of coral. It is not ideal, but is understandable in the instance. One of the weaknesses of Sharkwater VR is the length of some clips. Imagre from www.zoomdesign.com. Another weakness – and the more important one, in my eyes – is the brevity of some of the clips. You don’t always have the most time to look around, which is the opposite of what you want in a VR experience. I believe this is partially due to the cameraman being visible – if the clips are short, you won’t make a full turn and see him – but it would be nice to have at least a few more seconds in some of them. That weakness is counteracted partially through the use of starting points. Each clip had you open right where the action centered, which is exactly what you want. After re-watching the short clips a few times, you can see that some do not really have action going on elsewhere. But as a viewer who will more than likely never be in the diving position, I’d like the opportunity to still look around and see every inch that I can. Overall, I feel that Sharkwater VR is a great experience, giving viewers an opportunity to see underwater creatures in ways that they haven’t before, and may not ever get to do in person. You can learn more about the shark conservation efforts of Sharkwater by visiting their website, and watch the video on YouTube.